You want to remove as much blood from the liver as you can – it gives the liver a metallic taste. The liver is a filter for the blood. As such, it will have a lot of blood in it – and the more blood you can remove, the better it will taste. 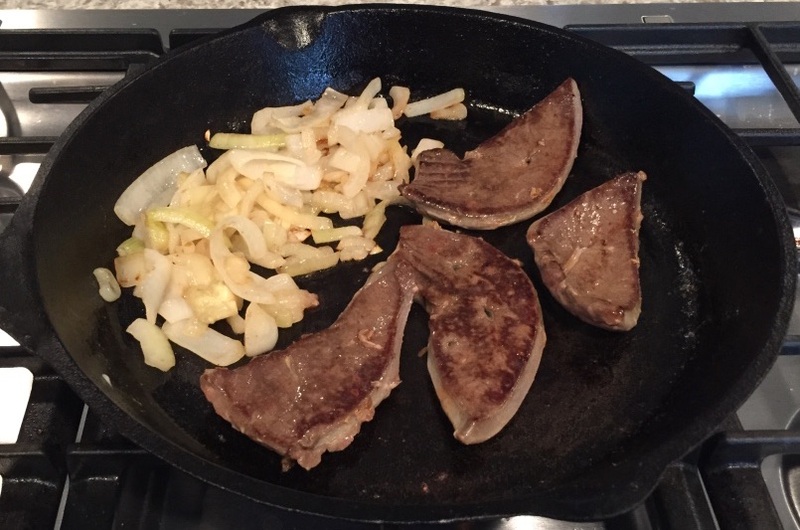 Fresh liver – from ANY animal – will have a bit of a metallic taste to it. This is BECAUSE of the blood. To cut back on that taste, it’s a simple matter of soaking. Now, you’ll never get all of the blood out – and if you could, it wouldn’t taste much like liver anymore. 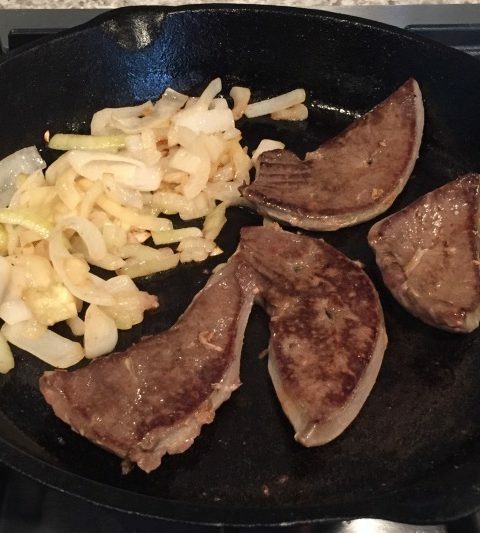 To start, slice the liver into several parts. The main reason for this is to expose more surface area to the brine solution. If you don’t cut it, you’ll find that the “skin” on the liver greatly impedes the soaking process. In a mixing bowl, dissolve a cup of kosher or pickling salt in a quart of water. You don’t have to be precise. I usually dump a bunch of salt in the bowl, and cover with enough water that I think will dissolve the salt, then stir till it’s dissolved. If it needs more water, I add a little more. 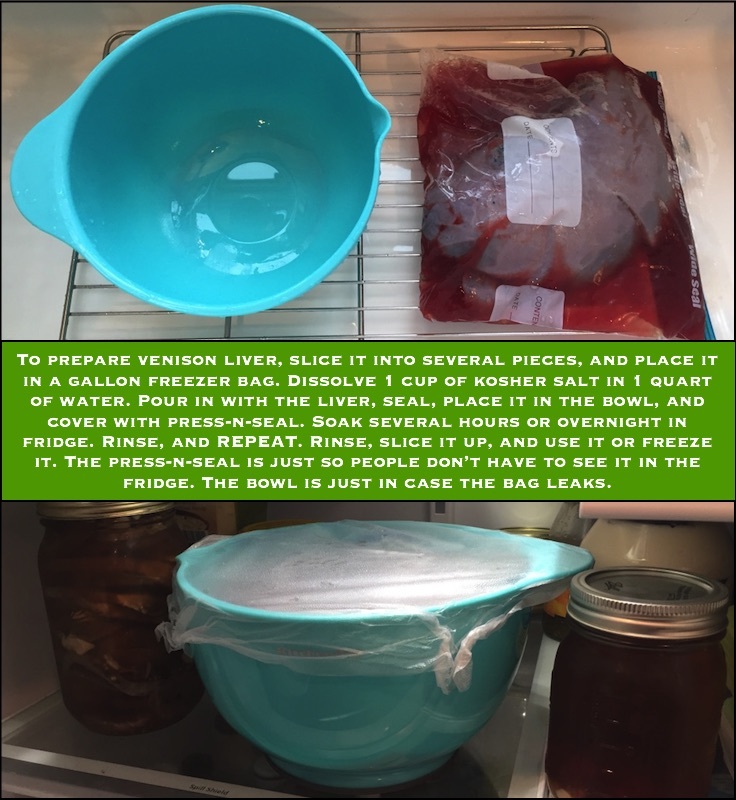 1) Freezer bags will leak when you least want them too. 2) You can cover the bowl with a paper towel, or press-n-seal, or maybe it even has a cover. Not everyone likes to see a liver soaking in the fridge! Soak it for a few hours then rinse it. If it’s still very bloody, mix a new batch of salt water, and repeat. Twice is usually good. Remember, you’ll never get all the blood out. After a final rinse, slice it into strips about 3/8 inch or so. You are ready to fry them up, or place the strips on wax paper on a baking sheet, and freeze them. Once they are frozen, I’ll take the solid strips and vacuum seal them in serving size portions – which are perfect for a lunch of liver and onions at a moments notice. As a final note on the liver: Carefully inspect it when you are field dressing the deer. If ANYTHING looks off about it, leave it with the gut pile. I ended up discarding the liver here because of black spots. These spots were speckled throughout when I sliced it. Don’t let this dissuade you from keeping the liver – I’ve only seen this twice out of about 20 deer – but always take a good look at it. If in doubt, leave it behind. 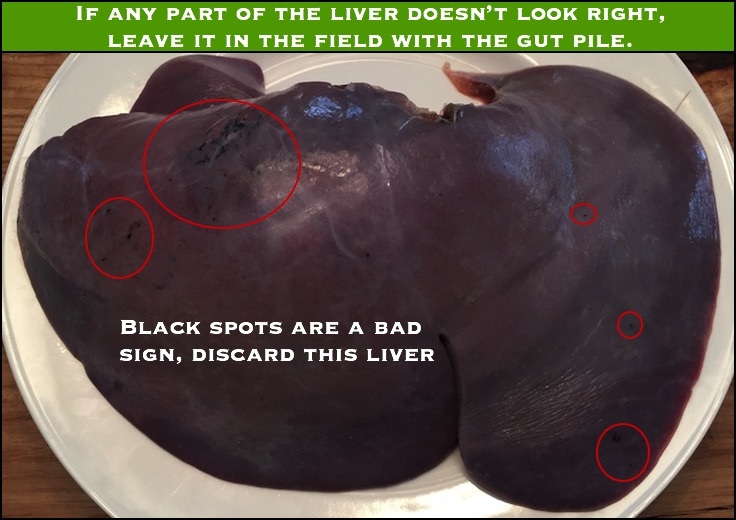 Carefully inspect the liver in the field. If it shows any odd signs, leave it in the gut pile for the animals.